Think of a futuristic war scenario where soldiers are firing smart weapons from the confines of their command centres. Weapons that are capable of intercepting and destroying virtually all enemy attack weapons and yet, they are fired from unmanned vehicles thereby minimising all possibilities of human casualties. This is the promise that nanotechnology has in store for the global defence industry, which is pumping billions of dollars in nanotech research, examining how nano science can improve defence capabilities. Potential benefits of nanotechnology in the defence industry include stronger, lighter and less-expensive materials and enhanced protection for military personnel. 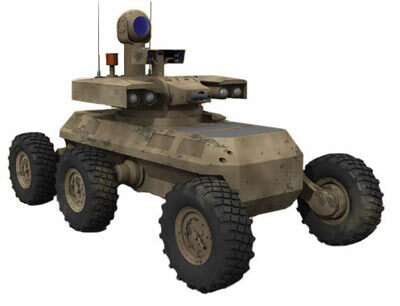 Large quantities of smart weapons � especially miniaturized, robotic weapons and intelligent, target-seeking ammunition without reliable remote off-switches could lead to unexpected injury to combatants and civilians, destruction to infrastructure, and environmental pollution. The rest of the Financial Express article deals mostly with 1st and 2nd generation nanotechnologies, although not explicitly. In fact, it tends to confuse some of the expected benefits of advanced nanotech ("visions of lightweight materials many times stronger than steel") with earlier generation projections. We've noted this sort of problem many times before, of course. It's difficult to keep writers from making such mistakes when even so-called experts in the field will sometimes conflate the risks and benefits of molecular manufacturing with other less revolutionary nanoscale technologies. For a more accurate and more complete look at the future of warfare, especially in the context of advanced nanotechnology, take a look at this presentation that I gave at the World Future Society annual conference in 2007 (and subsequently presented to a group of officers at the U.S. Naval War College). Further understanding of the potential impacts of emerging technologies on waging war can be gained by reading a convincing future scenario called "Crisis in Zefra," prepared by Canada's Directorate of Land Strategic Concepts. No matter how you look at it, the future looks more precarious than the present, unless we are fortunate and suddenly mature as a species before it's too late. 20 NOV UPDATE: Check out this skeptical article posted today titled "Are Pentagon Nerds Developing Packs of Man-Hunting Killer Robots?"